Tyler Stewart had been working since 5 a.m. and had just finished his shift filling vending machines when he got the call: Blues backup goalie Carter Hutton had hurt his foot in the morning skate and AHL goalie Ville Husso wouldn’t be able to get there from San Antonio in time for puck drop. So Stewart, 25, a Blues season-ticket holder in section 313, signed an amateur tryout contract and suited up as St. Louis’s backup. “A dream come true, obviously,” said the 25-year-old Stewart, who’s in grad school at nearby Maryville University and plays in an adult league. He’s got a hockey background, having played club hockey at Saint Louis University and played a bit of junior hockey. But he’s close by, and he’s available, and that’s the most important thing. Stewart, who’s the team’s emergency backup on call, says he brings his equipment to every game and leaves it in his wife’s car, just in case. “I got to listen to the pregame speech with [Mike] Yeo,” Stewart said. “It’s crazy how loose they are. You would think they’d be tight a little, but they’re joking around like you wouldn’t even think they’re playing a hockey game. It’s a cool environment, nothing like I’d ever experienced before. 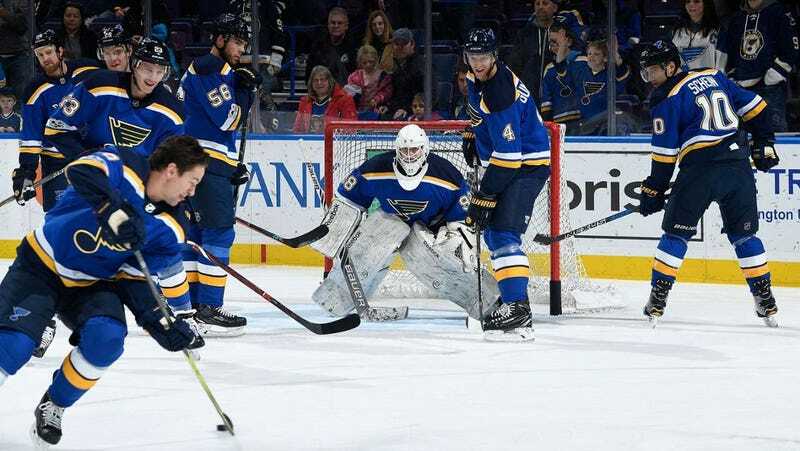 Husso arrived at the arena with about five minutes left in the first period, and Jake Allen was sensational in a 3-0 shutout of the Stars, so Stewart never got into the game. But he’s still an NHL goaltender, if only for one night, and quite honestly that probably qualifies him to start for the Isles or Sabres this year.